I mean interesting in a good way (you know how sometimes you use that word when you’re trying to be polite and don’t know how else to do it? Yeah, that’s not how I’m using it here, I just wasn’t sure how to start the blog post and that’s the best I could come up with. It’s almost the weekend, I apologize). I really enjoyed this book–Tales of Aerothos: Knights of the Wolf by Robert Nugent. 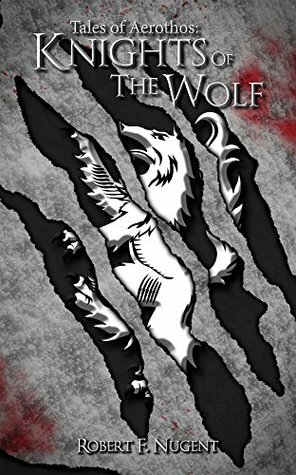 For me, Knights of the Wolf was a blend of both enjoyment and promise: I enjoyed what I read, but I’m also excited to continue seeing Nugent and his work grow as he does as an author, considering this is his debut. My favorite aspect of the novel was how realistic it felt and the way it was told, through a combination of diary entries, snapshots of every day life and the grueling struggles of war. At first, when Dmitry and his Hrukso companions would fight a battle and then return home, I was bit like, “Wait a second, you’re in a middle of a war! You don’t have time to just go home and dilly-daddle about!” Yet as I kept reading, I realized that some wars aren’t fought from beginning to end all in one go, especially when you bring in political complications and hazardous weather/changing of the seasons, like Nugent did. The further I read, the better the book became and I came to appreciate the blend of normality and war that Nugent did. It reminds me, as an afterthought, writing this review, to the same balance Jeff Salyards does with his Bloodsounder’s Arc. I did find myself wanting a little bit more from the book, though. Occasionally there were large jumps in time where I wished we could have stayed in-scene and been with Dmitry and his compatriots to see what they were up to, instead of catching up through his journal entries. Or I wanted the pace to slow just a tad so we could get a bit more description and scene setting. Or a few times when I though the dialogue could be stronger. It wasn’t necessarily a bad thing by any means. The fact that I was wanting more of the story reflects its current strength, already investing me with its characters and the world–and the world itself is very well fleshed out and obviously has a lot of history behind it. It was easy to believe the world we were reading was real, because of that deep history we felt–and because of the very well-detailed description of armor and of war. It definitely made me eager for a sequel. Oh, most definitely. I’m not sure if there is meant to be one or not, but if there is, I’ll be reading it. Overall, Knights of the Wolf was a joy to read, even if I had a couple of things I wouldn’t mind being heightened along the way. I really loved how the plot, while focused on the war, also did a good job balancing out and showing the lives that the warriors were fighting to protect. I got a hearty taste of Aerothos that left me curious and wanting for more and, as a reader, I think that’s a pretty good place to be.